Andy and Terry have added another 13 levels to their treehouse. It is a spectacular place, full of amazing things to do. The problem is they have a book deadline. Never fear the good news is Terry has invented a ‘Once Upon A Time’ Machine. This is great it means their book can be written while they go off and have fun and it will still get done before the deadline. It is a simple matter really to program all the things they want in the story and then just hit start. Problems happen though when the machine won’t let them back into their treehouse when they decide to finish the book themselves. Things go from bad to worse as somehow the universe gets uninvented. How are Andy and Terry going to make things better and are they going to get their book finished on time? If you are a fan of this writing duo then you will know just what to expect, great amounts of sheer silliness. The text is clear and easy to understand, the story is action packed and funny, the illustrations are plenty, detailed and perfectly suit the story style. It’s hard to miss with a book from these two. 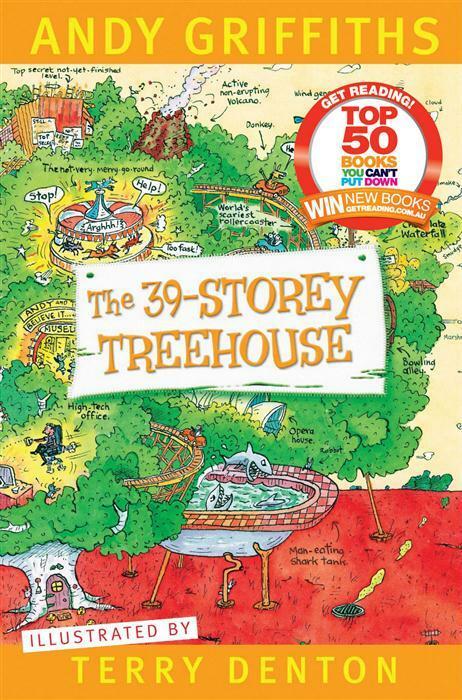 Don’t be expecting substance but for those who find it difficult to get into reading this series is probably worth putting in their hands, if for no other reason than the fact who wouldn’t want this treehouse. (I totally would never want to leave there.) A fun way to spend some time. Best suited for those 8+ though an interested reader from 6+ could also enjoy it.